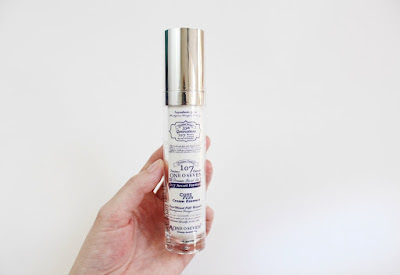 I am very excited to be reviewing the ONEOSEVEN Core Flex Cream Essence for you all. The brand had reached out awhile back and asked if I wanted to test out a few of their products. After researching the brand, I gladly excepted. 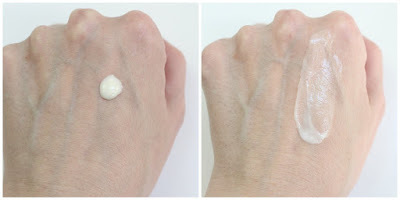 I tested the Cream Essence not only in the colder, winter months, but in the warmer late spring and early summer. I wanted to offer you all a very detailed post on how this essence worked when my skin was more dry and when it tends to be a bit oily. If you want to hear about my experience just keep reading. Before accepting any type of pr or gifted products, I am very thorough and take time to research the brand and products. As you know, ingredients are extremely important but so is the company, how they produce their products and how they give back to the community. The main reasons I wanted to test out this brand is because of their philosophy not only on their products but with outreach and helping to change the world. "Combining the wisdom of our ancestors and modern technology to produce products that can make this world more healthy and beautiful." I also love that the ONEOSEVEN believes in philanthropy and gracious devotes revenue and resources in partnership with UHIC to help make the world a better place for all. One hundred seven secret formulas began many centuries ago at a vinegar brewery. The company's name is derived from one hundred and seven secret formulas that have been kept for 35 generations to help improve health. Today, 107 combines these traditional secret formulas with modern science to help the skin stay youthful. This essence claims to provide tightening and brightening effects while deeply moisturizing the skin. To start, I like to begin all reviews with stating my skin types and concerns at the time of testing the product. I would also like to mention YRMV (your results my vary) as a disclaimer. My skin during this time of the year is normal to combination. However, my skin can be sensitive, temperamental and acne prone. I have found that with the incorporation of a retinoid such as my Curology treatment or Differin, my skin is less likely to breakout but is more prone to dehydration and flakey skin. My review will reflect how this product works for my personal skin types and condition. Every product I use goes through a very detailed patch testing period. I always patch test and I recommend patch testing to everyone. Although there is an argument out there patch testing doesn't actually work on The Beauty Brains, patch testing has saved my sin from some pretty serious negative reactions. Although I do agree with TBB (and love their this pod cast) that patch testing does not work against evaluating whether a certain product will cause breakouts. I do believe patch testing will help determine if your skin is allergic to the ingredients. This type of reaction is seen in the form of itching/stinging, intense flushing, burning, rash or hives. I introduce new skin care products to my easily irritated and often sensitive skin by patch testing. Patch testing can look different for everyone but for me, I test products in stages. For this cream, I applied it to my more sensitive areas which happen to be on my neck, chest and behind/in front of my ears. I applied this product twice within a 24 hour period. If all goes well, I begin to use the product on certain parts of my face, working up to using the product all over. I am a huge fan of the packaging. The essence is housed in a thin, double walled sturdy plastic tube with navy writing on the inner portion and white writing on the outside. I also love the navy box with the various fonts as it reminds me of an old school, turn-of-the-century apothecary type packaging. The airless pump container is 50ml / 1.7 fl. oz. This essence won the first grand prize award in the 11th World Anti-Aging cosmetic brand in 2016 and I can understand why. This cream essence is very firming and offers superior anti-aging benefits. 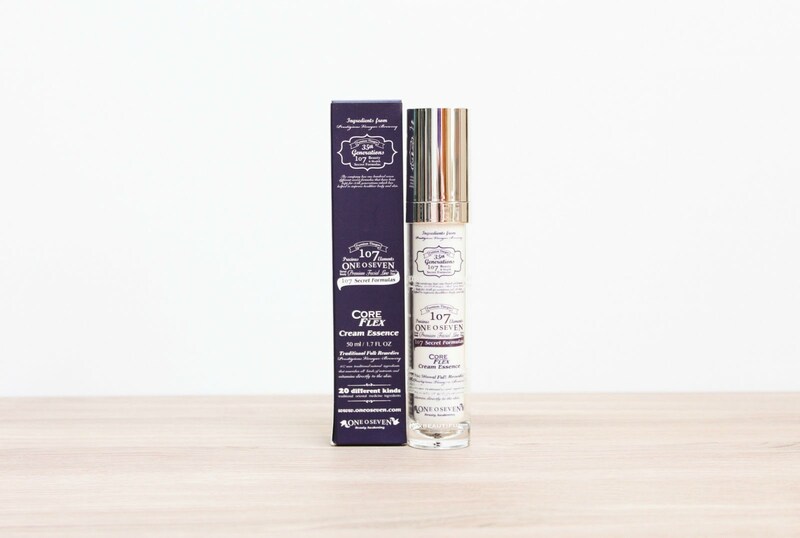 All of products from ONEOSEVEN use 100% naturally fermented vinegar in their formulations. After research and development, creator Okran Chungfound discovered that using specially aged vinegar with twenty oriental herbs produced a high content of essential amino acids. These amino acids have the power to diminish skin aging. Other notable ingredients include squalance (anti-inflammatory and moisturizing). Arbutin (brightening) and adenosine which is great for repairing. This also contains a few other moisturizing, anti-inflammatory botanicals plus retinyl palmitate which is a gentle form of vitamin A. Vitamin A can make your skin more sun sensitive so please use daily SPF. As you can see in the above pictures, this essence is very creamy and has a slightly off white color. This has a very elegant, creamy liquid feel that although dense, it absorbs very nicely into the skin without leaving an oily or greasy residue. This does have a sweet, floral scent that I do wish was more faint however it does dissipate rather quickly. For such a creamy product, this essence really absorbs fast and plumps my skin. This leaves no oily residue as it literally disappears into the skin. When I first felt this velvety creamy liquid, I immediately thought that this was going to be way too heavy for my combination skin but I was wrong. This does hydrate and moisturize but that is not it's main purpose. I have found this essence to be best used for brightening, evening out skin tone, strengthening and firming. My friend Fiddy and I were chatting about how she actually felt this essence lift and firm here skin. I had never really felt the same sensation....probably because it soaks into the skin so quickly that I would just move onto my other skin care products. When I actually took the time to let the product sit without adding additional products on top, I did notice that my skin would get a tightening feel. Not a bad tight but more of a lifting sensation. I have a small obsession with products that blend traditional, medicinal ingredients and modern day technology. Using both, I feel like you are getting the best of both worlds...proven naturally derived ingredients with science and technology to keep the skin healthy and youthful. Overall, I found this essence to brighten and offer that lifting effect however, this did not offer enough hydration for my drier areas. I held onto this product until the warmer months and this works much better for my skin now that I am more combination. Drier skin types will most likely want to layer this essence with other hydrating and moisturizing skin care products. For those with oily skin, this might give you just the right amount of hydration and moisture. At around 70 dollars, this is a pricey essence however, I have found that this is very anti-aging and brightening. I also love that this is rich yet not at all heavy and literally disappears into the skin.